Updated 06.14.2018: Is a Florida Keys road trip on your bucket list? It’s an iconic trip for boomer travelers that brings back memories of rolling down the highway with the windows open, ocean breezes, and quirky fun. 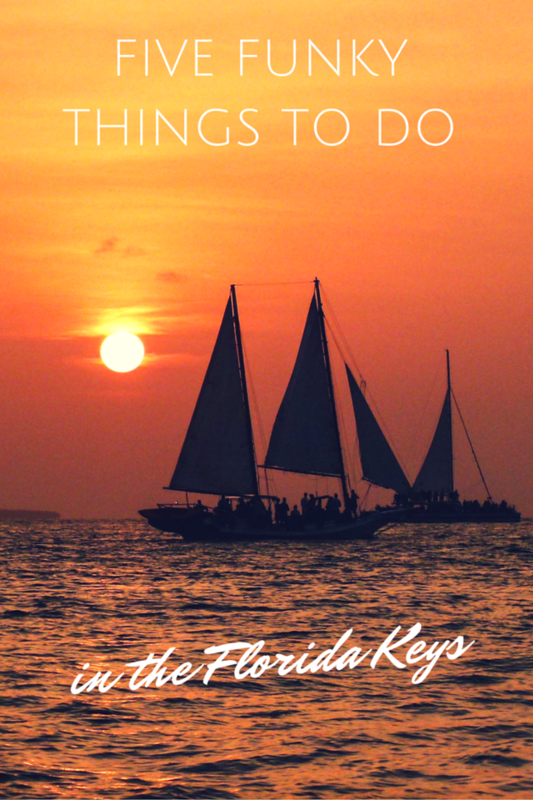 If you’re headed to Florida, follow our list of funky things to do in the Florida Keys. Your itchy travel feet will thank us! On a Florida Keys road trip, as a guest of The Florida Keys and Key West, I expected to indulge in tasty seafood, treat myself to key lime pie, appreciate early American history, go charter fishing and photograph numerous sunsets. While I found all of this and more, what I didn’t expect to find were the fun choices of funky things to do in the Florida Keys. Looking across the bow of the African Queen. Movie history, here I come. How many film buffs can say they cruised on a movie set? When Captain Lance Holmquist stokes the steam engine of the original vessel used in the movie, The African Queen, I channel my inner Katherine Hepburn. The famous Hollywood actress joined movie icon Humphrey Bogart in the 1951 film based in Africa’s Congo. The steamboat, also known as the African Queen, could certainly be considered a co-star. 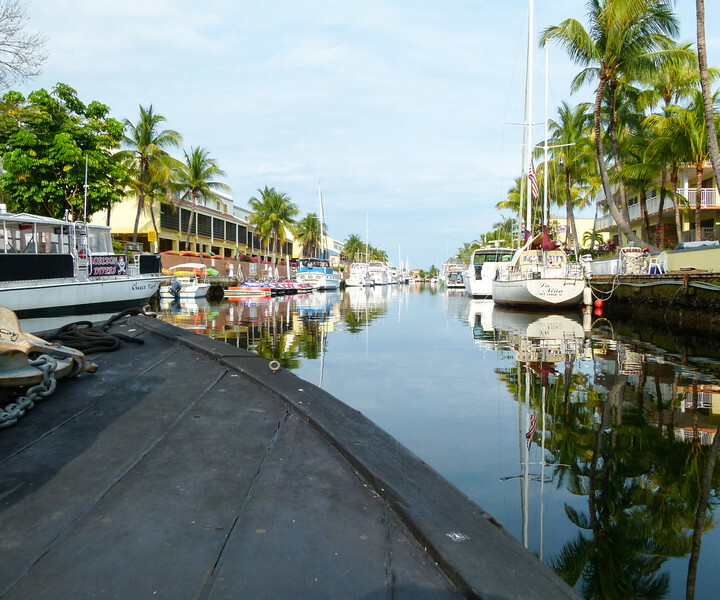 As the boat lurches slowly along a canal in Key Largo, Captain Lance shares stories from the making of the movie. It’s a noisy endeavor what with the chug a chug chug of the engine and occasional shrill shrieks as Capt. Lance blows the African Queen’s whistle. Florida Keys visitors can experience the African Queen on a 1.5-hour journey through Key Largo’s canals to the Atlantic Ocean and back. Or book a 2-hour dinner cruise that stops at Pilot House Restaurant for a 3-course meal. Click here to book your African Queen canal tour. Take a four-hour snorkeling excursion. Extend your trip. Discover where to stay in Key Largo. I never thought I’d be kneeling on a dock holding a slimy fish so that another fish with a great big mouth could eat it. But that’s exactly what I’m doing at Robbie’s Marina in Islamorada, Florida. Actually, I’m feeding one of 100 tarpons that hang around this special Florida Keys spot where Florida Bay meets the Atlantic Ocean. After throwing a bait fish into the water to attract the tarpon—also known as silver king—I kneel on the dock, holding a fish between my thumb and finger and wait. A tarpon jumps to grab the tasty morsel; I squeal and let the bait fish go. It misses the tarpon’s mouth but is quickly snapped up by another fish. For $1 dock admission and a $3 bucket of fish, you, too, can squeal when feeding the tarpon. 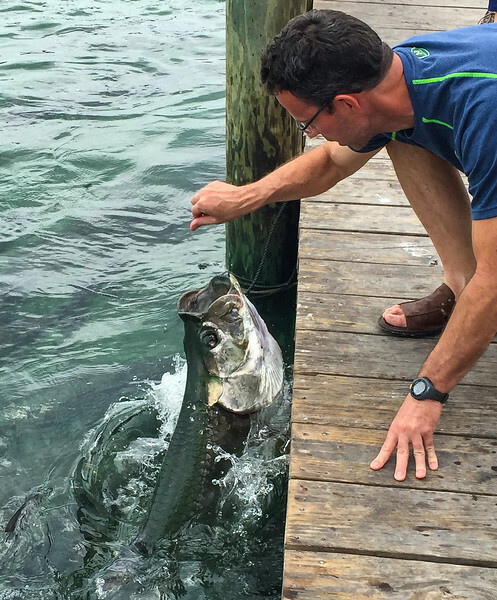 Feeding tarpon isn’t the only attraction at Robbie’s Marina. 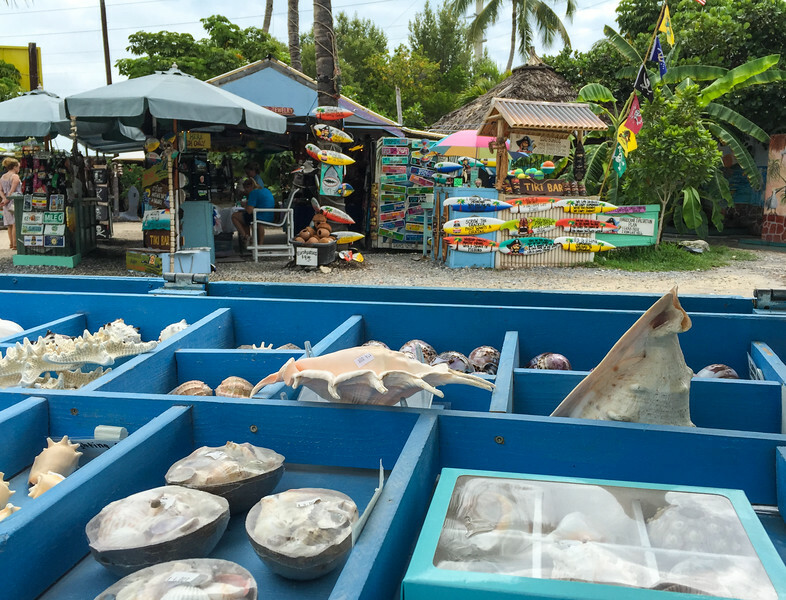 Enjoy browsing the mix of art, crafts and kitsch at the open-air shops scattered around the grounds before relaxing with a cool drink and Caribbean inspired meal at The Hungry Tarpon. A Florida Keys road trip on the Overseas Highway is meant for taking it slow and enjoying the scenery. 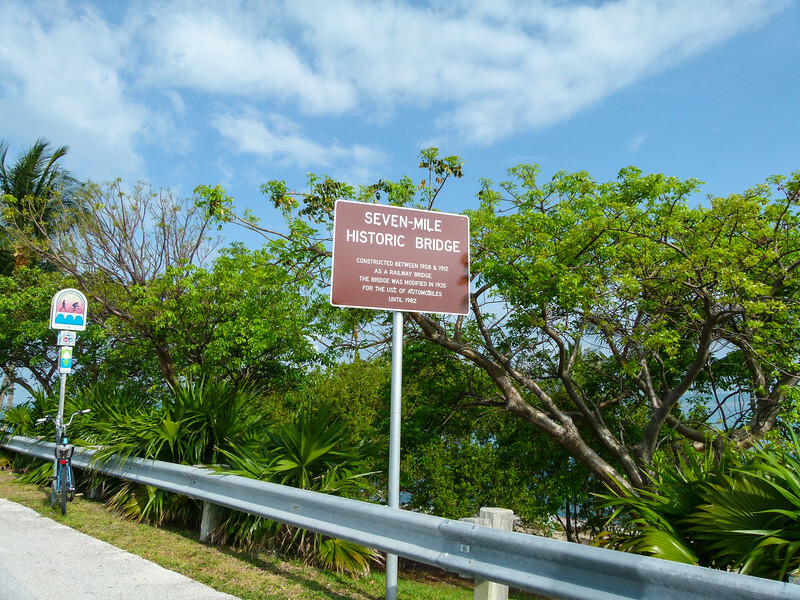 In Marathon, get out of the car at the Seven-Mile Historic Bridge for a walk on a span of concrete that’s now on the National Register of Historic Places. Visitors and locals walk, bike, rollerblade or run the 2.2 miles portion of the bridge that’s open to recreationalists. 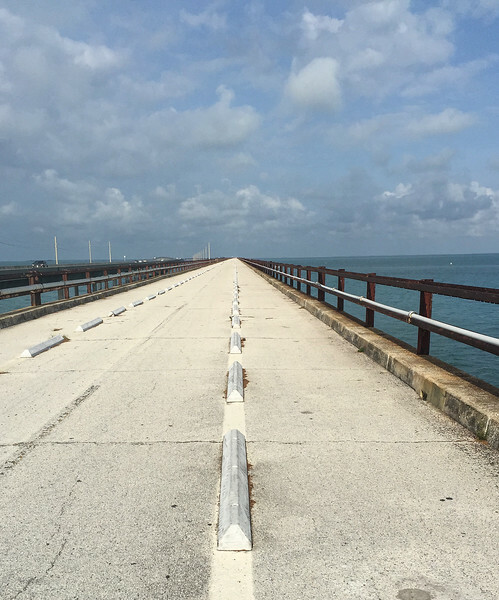 Walking beside Florida Keys history—the bridge was originally part of Henry Flagler’s railroad that connected Miami to Key West—I peer over rusted highway rails and down into the clear water of the Gulf to look for sea life, including sharks. Next time, I’m planting my beach chair on the bridge in the late afternoon to watch the sun cast an orange glow across the water. 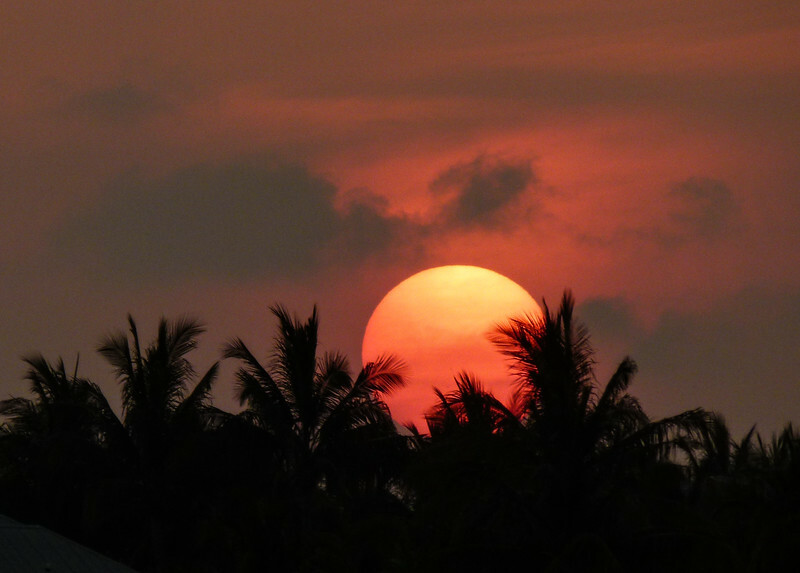 What’s funky about a Florida Keys sunset? The street carnival known as Sunset Celebration, held each evening at Mallory Square on the Key West waterfront, definitely qualifies. For two hours before sunset, street performers entertain the crowds with acts and physical fetes that defy description. Add arts and crafts booths, street musicians, food carts and more—illuminated by a fiery red sunset—for one funky celebration. I start my evening with authentic Cuban dishes at El Meson de Pepe before walking over to Mallory Square. It’s hard to know where to begin. Should I watch the Great Rondini perform mind-blowing escapes or marvel at tight rope walker Will Soto? And then there are the arts and crafts to browse. But when that big orange ball of sun begins to dip behind Sunset Key, it’s time to join the crowd, stand on my tiptoes and blindly click the camera shutter to capture the show. Probably the funkiest, and most fun, Florida Keys travel experience is watching the Great Bloody Battle of the Conch Republic. 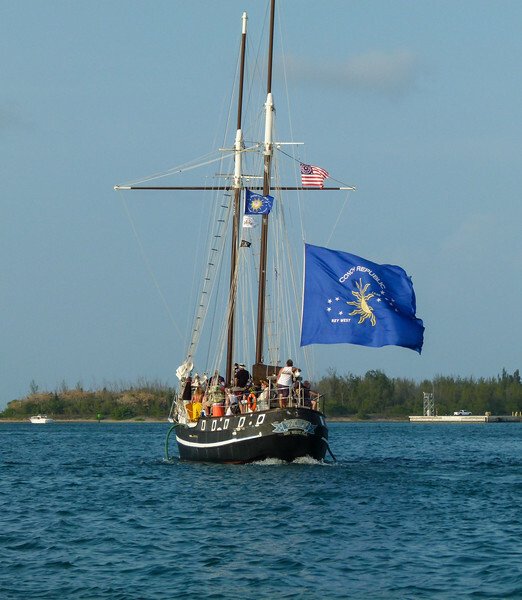 The pseudo sea battle is held during April’s Annual Conch Republic Independence Celebration. My Key West visit coincides with the celebration commemorating the Florida Keys’ one-day succession from the U.S. on April 23, 1982, due to a federal drug blockade of the Overseas Highway. While local citizens made their point, the incident also inspired one of the Florida’s most notorious celebrations. 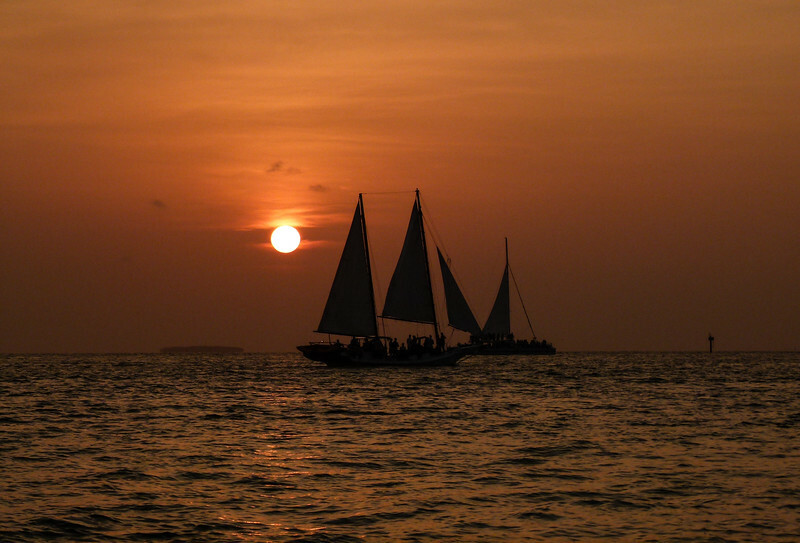 Key West Harbor is the place to be during the Great Bloody Battle for the Conch Republic. Like many other visitors and citizens, I’m on a boat in Key West Harbor to watch the Great Bloody Battle of the Conch Republic between Jolly Roger 2 and the U.S. Coast Guard. From the High Tide, a 33′ custom sloop, I witness the battle commence with planes dropping rolls of toilet tissue into the water while cannons from the Jolly Roger 2 shoot water at the Coast Guard boat. The blazing sunset provides just the right mood. Of course the Conch Republic wins, which means Coast Guard officers must surrender over drinks at the Schooner Wharf Bar. Dancing to live reggae music is part of the funky fun. Yeah, mon. For more boomer travel fun in Florida, check our tips for spending a weekend on Amelia Island. Disclosure: The Florida Keys and Key West provided this travel experience. However, as always, the opinions are strictly my own. And affiliate links are included for your convenience. However My Itchy Travel Feet receives a small percentage of the sale at no additional cost to you.